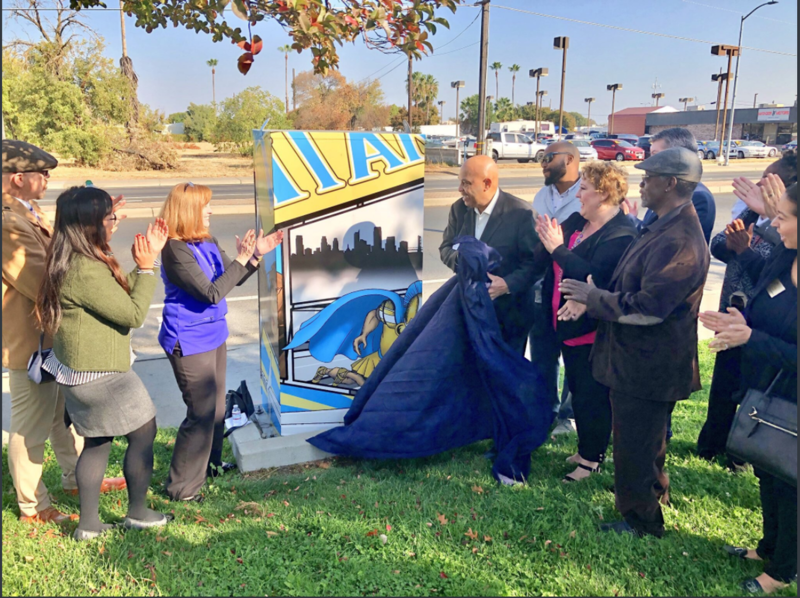 Sacramento, CA - Join Councilmember Larry Carr, local artists and community members for the unveiling of D8CRE8 Signal Box Wrap Art Project. D8CRE8 Signal Box Wrap Project was initiated in Fall of 2016 to bring more art into District 8. The project commissioned Sacramento-area established and emerging artists to create neighborhood-specific artwork along Florin Road and Meadowview/Mack Road. Local Sacramento artists were selected and tasked with observing the community and noting local gathering spaces and area landscape. Each artist then determined how best to enhance neighborhood streets with colorful imagery. Artists used a variety of media including photography, painting, collage, and digital imagery to develop their designs. A total of 27 utility boxes along Florin Road and Meadowview/Mack Road will be wrapped by November 3, 2017. Sacramento City Councilmember Larry Carr, Sacramento Metropolitan Arts Commission Cultural Services and Creative Economy Manager Jonathan Glus, Florin Road Partnership President Corey Deroo, local artist Shonna McDaniels and others will be present at the press conference. Community members and interested parties are encouraged to attend. Refreshments will be provided. "People are getting in their cars and driving down the street and playing a game of find the pretty box." Mayor Darrell Steinberg's speech @D8Cre8 Signal Box Wrap Art Project Press Conference. "This is a unique art project. 27 Utility Boxes...Art is about the neighborhood. Art is an essential piece of neighborhood revitalization."